Equestrian or horse races have long been a tradition in Italy. The Palio di Siena located in Siena, Italy, got its modern start in 1656. Vicenza Designs Equestrian line allows you to express your passion for horses in your home in a unique way. 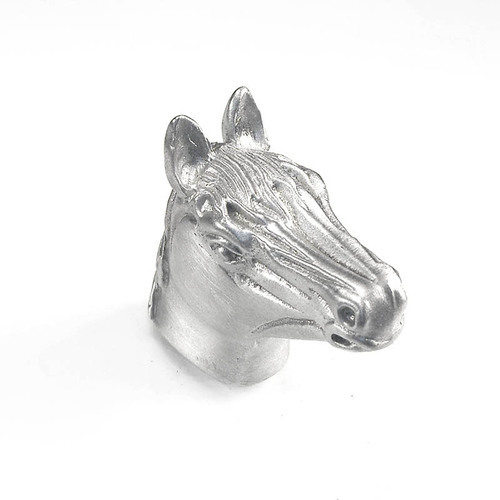 The horse head designed large knob is available finishes include Antique Brass, Antique Copper, Antique Gold, Antique Nickel, Antique Silver, Gunmetal, Oil-Rubbed Bronze, Polished Gold, Polished Nickel, Polished Silver, Satin Nickel and Vintage Pewter. Mounting hardware is included. 100% lead free pewter. Handcrafted in the USA. The largest national park in Italy, Pollino, covers more than 475,000 acres and is home to silver fir and lobels maple, rhubarb and mint, newts and yellow-bellied toads, golden eagles and eagle owls. The Pollino line of cabinet jewelry brings the essence of that Italian national park to your home. The frog large knobs are available in the following finishes: Antique Brass, Antique Copper, Antique Gold, Antique Nickel, Antique Silver, Gunmetal, Oil-Rubbed Bronze, Polished Gold, Polished Nickel, Polished Silver, Satin Nickel and Vintage Pewter. Mounting hardware is included. 100% lead free pewter. Handcrafted in the USA. Campo de' Fiori, a square in Rome, Italy, serves as a marketplace of fresh fruits and vegetables and a place where locals mingle and entertain. Fiori, therefore, represents the line of fruits and vegetable styled cabinet pulls and knobs by Vicenza Designs. The apple designed large knob is available finishes include Antique Brass, Antique Copper, Antique Gold, Antique Nickel, Antique Silver, Gunmetal, Oil-Rubbed Bronze, Polished Gold, Polished Nickel, Polished Silver, Satin Nickel and Vintage Pewter. Mounting hardware is included. 100% lead free pewter. Handcrafted in the USA. For sixty years Tiziano Vecelli was the undisputed mater of Venetian painting and the leading member of the Venetian School. He was employed privately and publicly to produce 100's of painting and lived well into his 90's. The Tiziano inspired line of fine pewter hardware is contemporary is style but enduring in design. Large leather knobs are accentuated with a square pewter piece with embossed squares. Choose black or brown leather. Available finishes include Antique Brass, Antique Copper, Antique Gold, Antique Nickel, Antique Silver, Gunmetal, Oil-Rubbed Bronze, Polished Gold, Polished Nickel, Polished Silver, Satin Nickel and Vintage Pewter. Mounting hardware is included. 100% lead free pewter. Handcrafted in the USA.